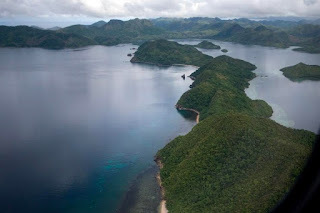 Palawan ▸ RJ Jacinto wants to offer Busuanga, other islands for rent | RJ Jacinto wants to offer Busuanga, other islands for rent | Economic Adviser Ramon "RJ" Jacinto wants to lease the island to multinational companies, who will be then given a free hand to "govern" it. A few days after being appointed as Presidential Adviser on Economic Affairs and Information Communication Technology, Ramon "RJ" Jacinto is proposing a relatively unique business proposal for the country. Ever heard of a "business utopia"? That is what RJ wants to do with one of the popular islands in Palawan, specifically the island of Busuanga. Bigger than Singapore, the island is best known for the tourist spot, Coron. How does one go about converting Busuanga into a business paradise? RJ wants to lease the island to multinational companies, who will be then given a free hand to "govern" it. They can build their own ports as they wish. The musician turned economic adviser, said in an interview with Cathy Yang, that leasing out islands like Busuanga does not mean the government will have no say in how multinational companies will run it. Companies leasing the islands will still be subject to Philippine sovereignty, although they may be allowed to operate "autonomously". For now, RJ might propose to President Duterte to lease out Busuanga. But if it succeeds, other islands may also be rented out to multinational corporations. He said islands with low population are quite ideal because only a few people will be displaced. Unorthodox as it may seem at the outset, Pres. Duterte might favor RJ's proposal. That's because Duterte himself broached the idea of leasing out islands and lands for 30 to 50 years during his presidential campaign. Netizens reacted to this idea by saying, why only multinationals? There are lots of companies and conglomerates owned by Filipino businessmen who are also capable of leasing these islands. Shouldn't they be given first priority when it comes to such proposals?